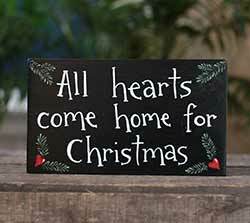 Christmas & winter themed signs and plaques from Our Backyard Studio, The Hearthside Collection, Primitives by Kathy, and lots more! 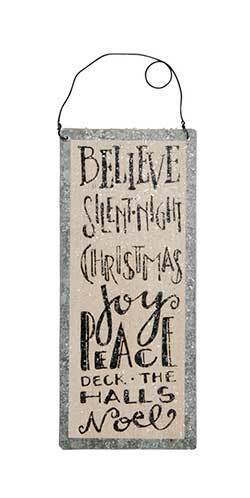 While I have always loved the simple sentiment "all is calm, all is bright," it seems especially needed this year, with so much chaos and turmoil brewing in the world. 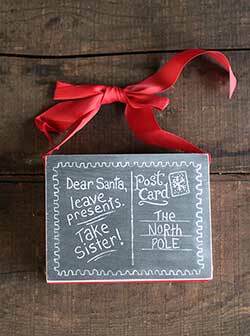 Painted in classic holiday red and white, this shelf sitter sign can be displayed all winter long! Set on a shelf, mantel, or desk at work, or hang in a small wall space! 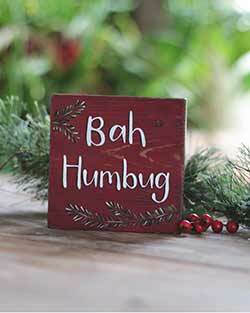 Unique with freehand painted artwork, this little Bah Humbug shelf sitter sign add quirky charm to accent your holiday season! 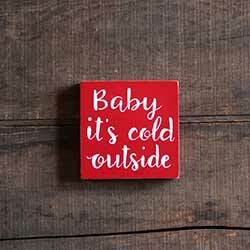 Set on a shelf, mantel, or desk at work, or hang in a small wall space! Painted and aged in red with white lettering, this deep wood box sign hangs on the wall or sits on a shelf. 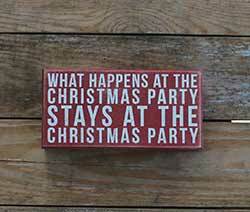 This one reads "What happens at the Christmas party stays at the Christmas party." Galvanized tin sign painted black, featuring a hand-lettering-style font in black, distressed for a rustic look, and lightly dusted with mica glitter. Galvanized tin sign painted cream, featuring a hand-lettering-style font, distressed for a rustic look, and lightly dusted with mica glitter. Family Dysfunction Box Sign, by Primitives by Kathy. 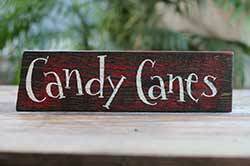 Painted and aged in red with white lettering, this deep wood box sign hangs on the wall or sits on a shelf. 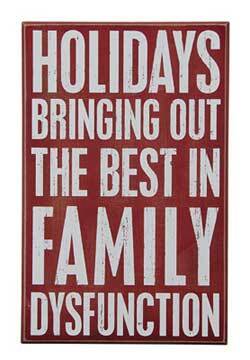 This one reads "Holidays: Bringing out the best in family dysfunction." Measures 9 x 14 x 1.75 inches. Wood, intentionally aged/distressed for a rustic look. 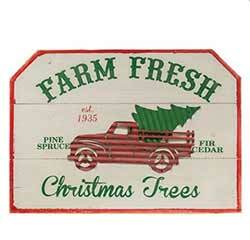 Painted and aged in red with white lettering, this deep wood box sign hangs on the wall or sits on a shelf. 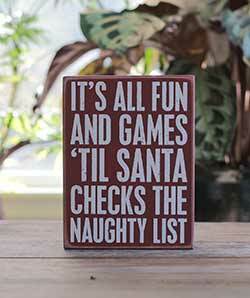 This one reads "It's all fun and games 'til Santa checks the naughty list." 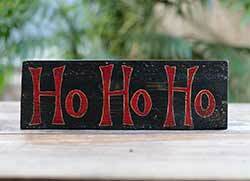 Unique with freehand painted artwork, this Ho Ho Ho shelf sitter sign adds a vintage vibe to your holiday decor! 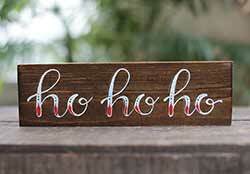 Welcome Santa with this jolly Ho Ho Ho sign, unique with freehand lettering and rustic reclaimed wood! 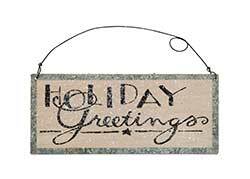 Holiday Greetings Tin Sign, by Primitives by Kathy. Galvanized tin sign painted cream, featuring a hand-lettering-style font in black, distressed for a rustic look, and lightly dusted with mica glitter. This one reads: Holiday greetings. Measures 7 x 3 inches. 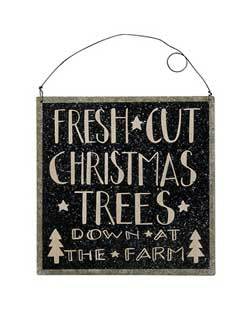 Other metal signs and ornaments also available! 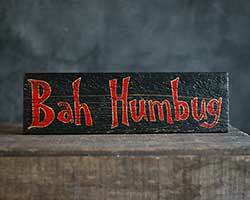 Holly Jolly Tin Sign, by Primitives by Kathy. Metal painted black and cream, lightly dusted with glitter. Measures 9.5 x 3 inches. 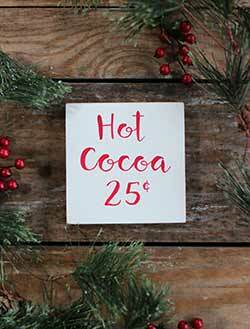 Unique with freehand painted artwork, this little Hot Cocoa shelf sitter sign add charm to accent your holiday season! 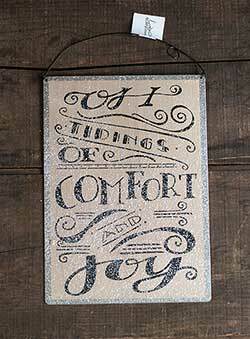 Set on a shelf, mantel, kitchen window, or hang in a small wall space! 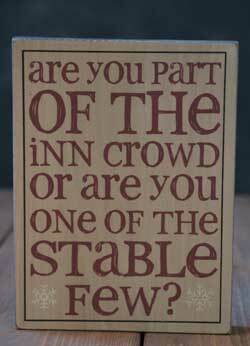 Reads: "Are you part of the inn crowd or are you one of the stable few." 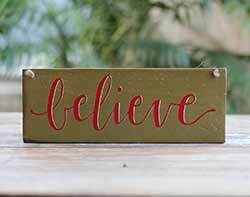 Painted and aged in red with white lettering, this deep wood box sign hangs on the wall or sits on a shelf. 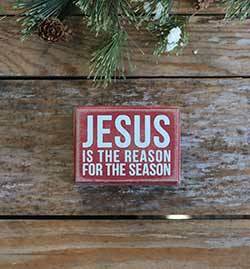 This one reads "Jesus is the reason for the season." 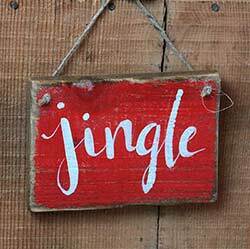 Add a rustic touch to your home this holiday season with this hand lettered wood Jingle sign, perfect for that rustic country Christmas! 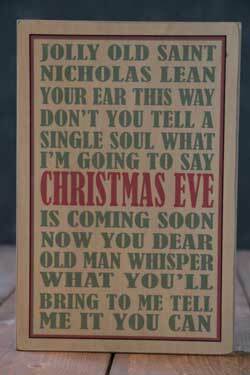 This box-style wood sign is painted with the first verse of the beloved Christmas carol "Jolly Old St. Nicholas"! This is for the BURGUNDY sign. 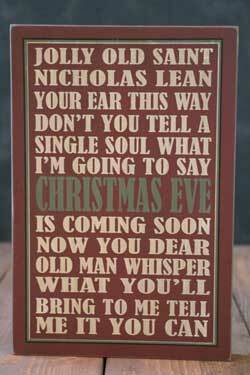 This box-style wood sign is painted with the first verse of the beloved Christmas carol "Jolly Old St. Nicholas"! This is for the GREEN sign. 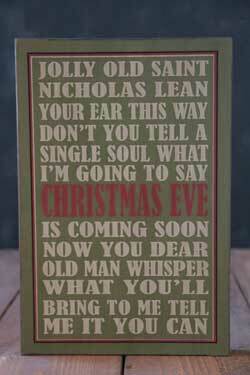 This box-style wood sign is painted with the first verse of the beloved Christmas carol "Jolly Old St. Nicholas"! This is for the TAN sign. 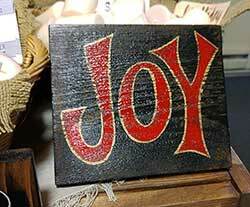 Add a rustic touch to your home for the holidays with this hand lettered "joy" sign, featuring reclaimed wood and layered with color and distressing! 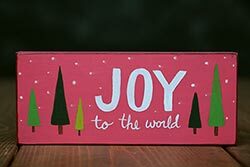 Joy to the World Box Sign, by Primitives by Kathy. 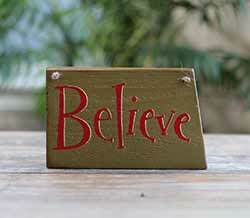 Painted and aged in grey with white lettering, this deep wood box sign hangs on the wall or sits on a shelf. 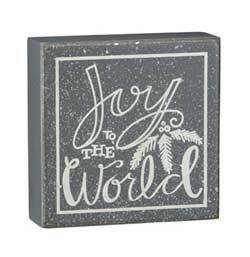 This one features a hand-lettered-style font and reads "Joy to the World." Lighted dusted with clear glitter. Measures 5 x 5 x 1.75 inches. Wood, intentionally aged/distressed for a rustic look. Joy to the World Shelf Sitter, by Our Backyard Studio in Mill Creek, WA. 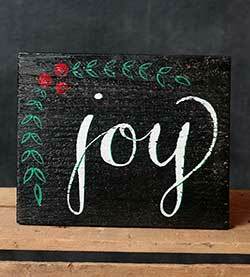 Lettered and illustrated completely free-hand in retro-Christmas-style colors. 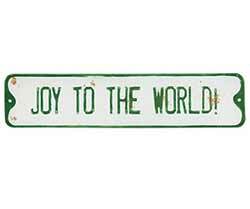 "Joy to the world" is in white, trees are shades of green. Background is a deep rose pink, and very lightly antiqued for a vintage look, and edged in antique brown. Galvanized tin sign featuring a hand-lettering-style font, distressed for a rustic look, and lightly dusted with mica glitter. 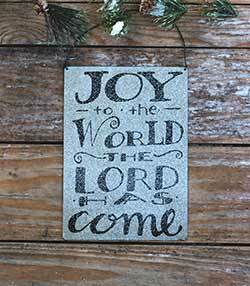 This one reads: Joy to the world, the Lord has come. 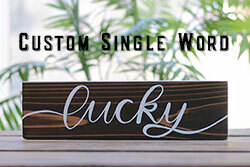 Green Joy Vertical Hand-Lettered Wooden Sign, by Our Backyard Studio in Mill Creek, WA. 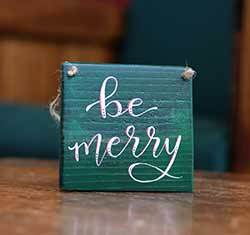 Painted on piece of quality wood molding reclaimed from a renovated house, this rustic wood sign features free-hand lettering in cherry red against a medium, muted green background. Letters are outlined in metallic gold. 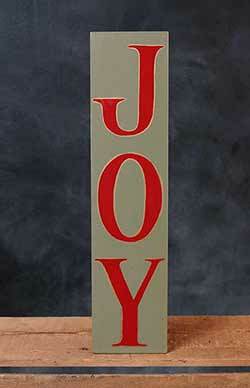 Reads: "JOY." No computers/stencils/vinyl/transfers were used to create this sign - Painted the old-fashioned way, completely free-hand with professional sign painter's enamel and quill brush. 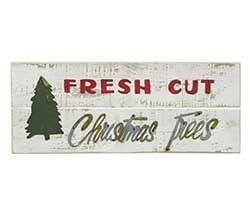 Spruce up your primitive home or farmhouse this Christmas season with this handmade wooden sign, featuring modern hand lettered calligraphy in a classic palette of black and white, with vines and berries adding a pop of color. Let it Snow Chalk Shelf Sitter, by Our Backyard Studio in Mill Creek, WA. Lettered free-hand in chalk style white against a black background. This block is a shelf sitter (no hanger). Sealed with matte varnish. Measures approx 6 inches long, 2.5 inches high, and 3/4 inch thick. Made in the USA.